Northside Elementary School principal Cheryl Carnahan shows off the new building. CHAPEL HILL – Students in Orange County and Chapel Hill-Carrboro City Schools head back to school on Monday morning–and for two elementary schools in the Chapel Hill-Carrboro district, the first day of the new year also marks the first day of a new era. 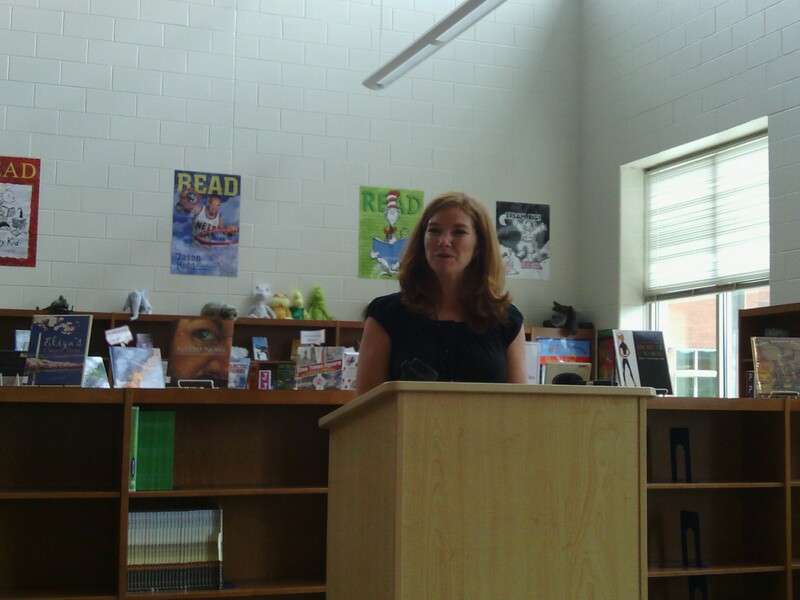 FPG Principal Bivins speaks at a press conference Thursday at the new Northside Elementary School. More than 500 kids are enrolled at FPG, about half of which are new students in the district’s Spanish dual-language program. 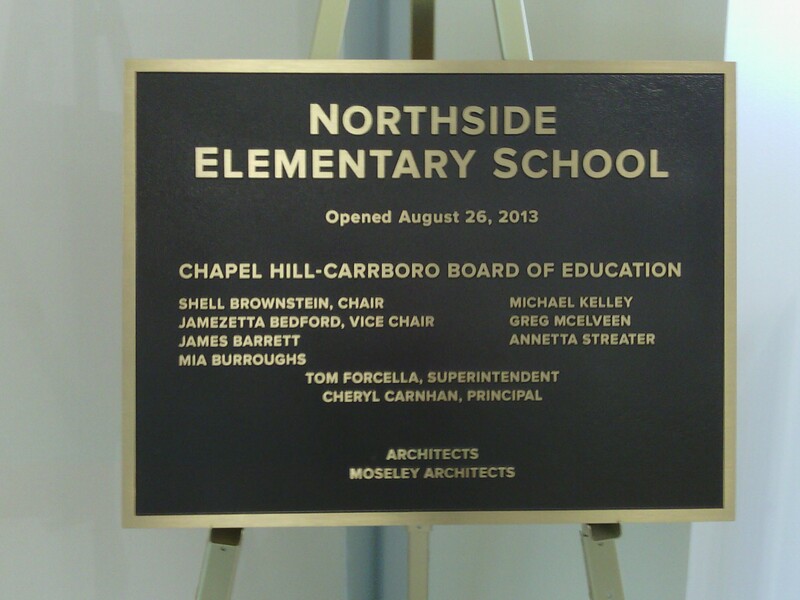 Meanwhile across town, the new Northside Elementary School is finally open for business after years in the making–with 496 students enrolled and 80 employees on staff–and school officials like principal Cheryl Carnahan (formerly of Estes Hills Elementary) say they couldn’t be more excited. Carnahan says Northside’s mission statement is “Thinking, learning, and growing, with purpose, persistence, and pride.” Purpose, persistence, and pride are joined by a pedagogical approach that’s eminently forward-thinking, while still nodding back to the past. 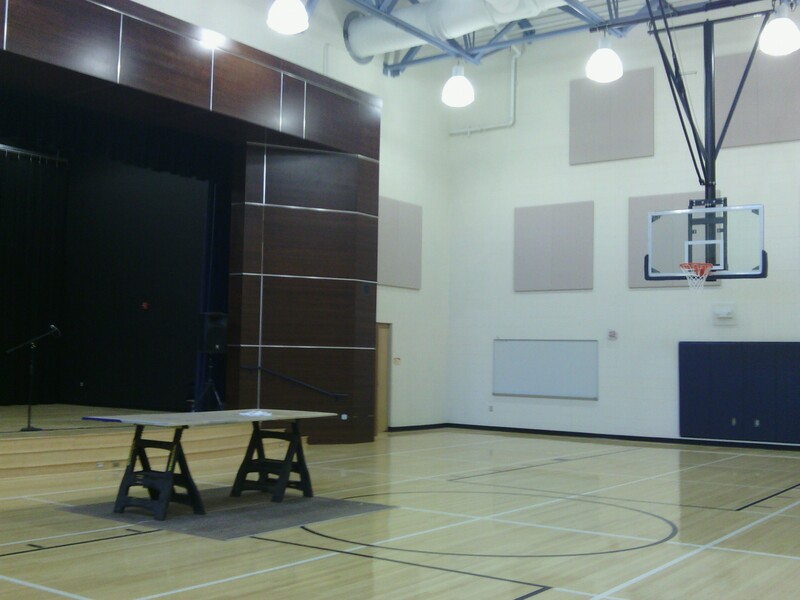 A tour of Northside Elementary is striking: every facet of the new building is consciously tailored to be both eco-friendly and high-tech, from the placement of the windows to the design of the students’ chairs. 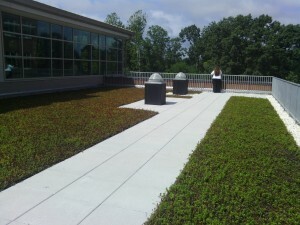 Reflectors and skylights throughout the building maximize natural light to save on electricity; that electricity is channeled instead into a wide variety of state-of-the-art technology–including iPads (one for every two students), high-speed wireless Internet, and interactive whiteboards that also function as massive touch screens. (Chalk on a slate is ancient history.) 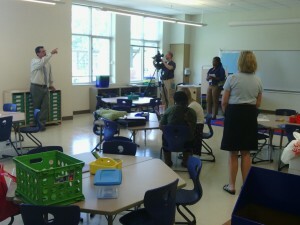 Students sit on chairs designed to allow for wiggle room (they’re even comfortable for adults), and the teachers wear microphones to ensure sound quality. Moseley Architects construction administrator Steve Nally (L) points out some key features in a Northside classroom. 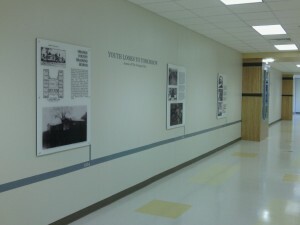 But even as Northside looks to the future, it’s also making a concerted effort to stay rooted in its historic past. 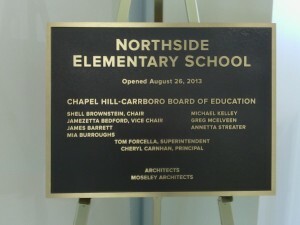 Its location at 350 Caldwell Street is also the site of the original Northside Elementary, which served as Chapel Hill’s elementary school for African-Americans prior to integration. That history is preserved on the first floor of the three-story building, with a commemorative wall, a trophy case, and a gallery of decades-old photos–a veritable museum of the Northside community’s educational history. That history will make its way into the classrooms as well: Northside’s approach revolves around student-driven, “project-based” learning, and Carnahan says the first schoolwide project will focus on Northside. And since the school is seeking to look in two directions at once, it’s only fitting that Northside’s symbol is the compass–there are dozens of them on the walls, floors, even the clocks–and the team name is the Navigators. Neither Northside nor FPG are opening without controversy, of course. 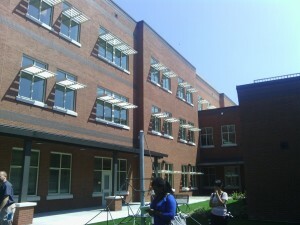 In 2012, parents at FPG protested strongly against the school board’s decision to convert the school to a dual-language magnet—and earlier this year, parents across the district spoke out against the new redistricting plan, which moved a large number of students out of their previous schools to ease overcrowding and make way for Northside. 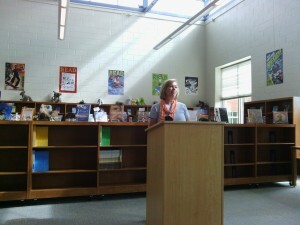 And as students across Chapel Hill-Carrboro return to class, school officials behind the scenes are still contending with another round of budget cuts at the state level–not to mention the threat of an even more difficult financial strain next year, when the district’s fund balance is projected to run dry. Still, Monday is a day of pride and optimism for local schools–Northside, FPG, and everywhere–as thousands of Orange County students return to what remain two of the top-rated districts in North Carolina. 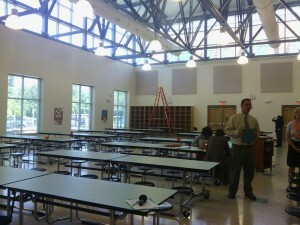 Skylights abound in Northside’s cafeteria. 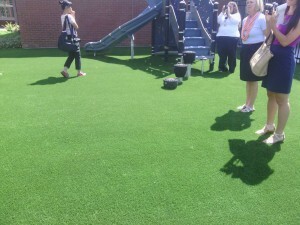 A closer look at the playground: that’s actually artificial grass down there. 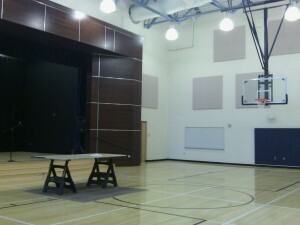 Not far from the history wall, Northside’s gym/auditorium–complete with elevated stage–nears completion. The redistricting was nothing short of a tragedy. 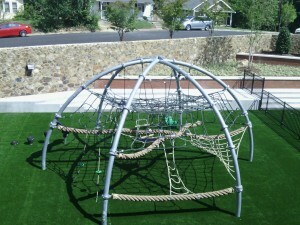 The use of weak data and an antiquated approach has yielded these rewards. I’m sure all the elementary kids standing bleary-eyed at the bus stop this morning before 7am thank you for their new longer commutes.